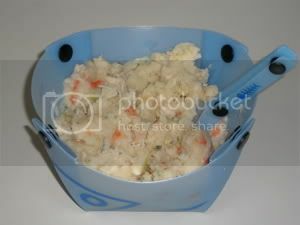 This recipe is a bit of a twist on mashed potatoes. It features chicken, chicken gravy and a lot of vegetables. It is a dish that will stick with you. It also isn't overly salty either (in the range of 600 mgs or so of sodium). The recipe features Simply Organic's Roasted Chicken gravy mix, though you can use any brand you prefer. SO's doesn't have MSG and is not as salty. You can find SO's line in many grocery stores or natural food stores. Add 1 1/2 cups boiling water, stirring well. Put in a cozy for 10 minutes. Stir again and serve. Serves 1 large appetite for dinner, 2 for lunch. PS: A bit of hot sauce added will give it a kick! OK, you've got me hungry now! What do they use as the base for these items? For chicken? I like the Swanson brand of 3 ounce chicken. At Target you can pick up 3 packs of that size. Good stuff! The other brand I can see in my mind, but not the brand name...I find it in the grocery stores in 3 packs also. It is the same company that makes the 7 ounce pouches out West. Nice thing about the 3 ounce cans is they come with pop tops almost always. Eerrr!! !My system is not soy compatible. Are there any products in their line that use gluten as the base for the meatless meats? My problem with Mt. 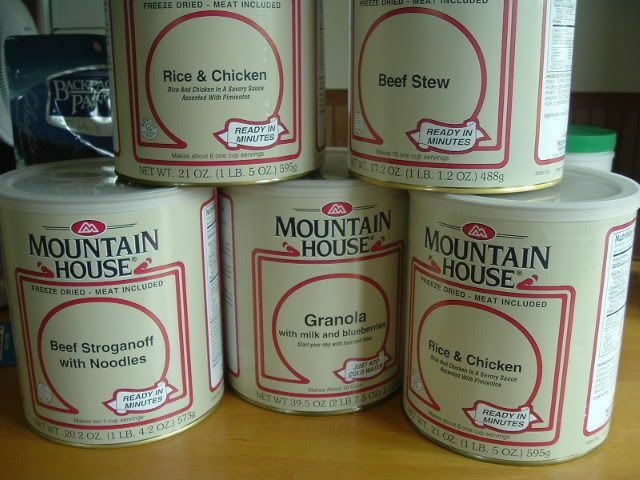 House is they still use MSG in a number of their meals And the sodium is sky high! So for me, I honestly cannot use freeze dried meals, but I can use freeze dried veggies, fruits and meats! sarbar wrote: I honestly cannot use freeze dried meals, but I can use freeze dried veggies, fruits and meats! Nightwalker, I get them from various sources. The best freeze dried vegetables and fruits are at http://www.justtomatoes.com Very high end quality. Welcome to the board Davebeebeconst ! Glad to have you here. Feel free to look around and throw in your thoughts anytime !